Pair of Pileateds. © Bruce Stambaugh 2014. When I hear that distinctive, penetrating squawk outside, I usually grab my camera and head to a window at the rear of our home in Ohio’s Amish country. A Pileated Woodpecker, or maybe two, is brashly announcing its arrival. As a birder, I have been fortunate to have Ohio’s largest woodpeckers coming to the feeder regularly year-round. They especially frequent the feeder in the summer when the parents bring a juvenile to the peanut butter suet feeder that hangs from the backyard sugar maple tree. I have had all three birds near the feeder at the same time, but never on the feeder simultaneously. As you can see, I can no longer say that. When I glanced out a window recently after hearing that call, I was pleasantly surprised to see both the male and the female on the feeder opposite one another. Even as an average birder, I knew this was a very rare event. Most birders long to even see a Pileated Woodpecker, much less have them as a yard bird. Pileateds are normally shy birds that keep to the deep woods. Why this pair feels safe in visiting my backyard, I don’t know. I’m just glad they do. I know I was extremely fortunate to have both the male and the female together in the same photo. 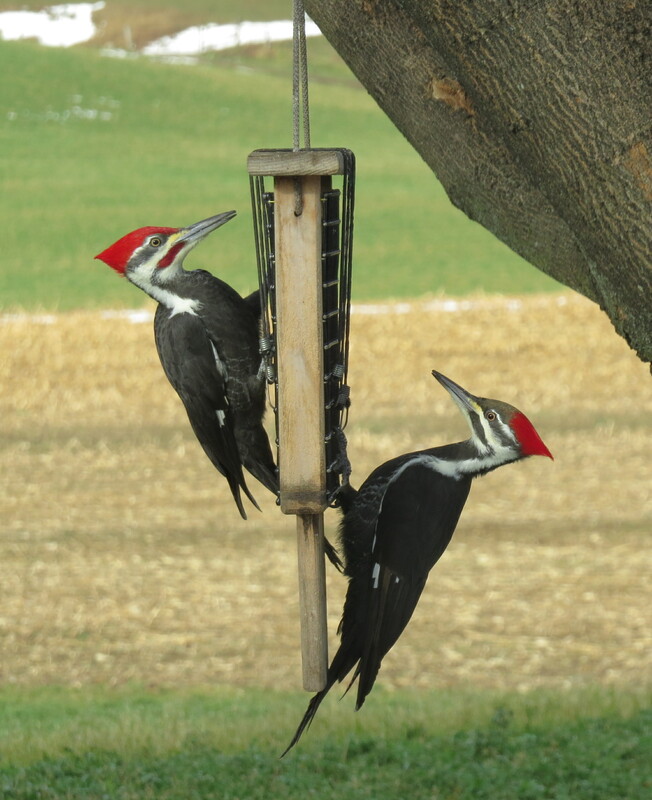 “Pair of Pileateds” is my photo of the week. I think they come because you feed all of your guests so well! Not a common sight at our feeder. Plenty of visits from hairy and downy but not these big ones. Great shot. Thanks, Gail. At least Neva fed you more than peanut butter suet. We’ll have to offer that to Don on your next visit. I’d wish you Happy Thanksgiving, but you all already had yours. You are a lucky birder! And a great picture too! Luck! It took me a long time to earn the trust of those two beautiful birds. 🙂 Indeed, I feel very fortunate. I’m glad you liked the pic. These are beautiful, what a great photo. I get pileateds where I live, too, and love to watch them. Thank you so much. I’m glad you liked the pic.